This is my favorite Aidan bottling since the beautiful 2010 vintage and likely the finest these mature vines have produced – time will tell. This beautifully balanced, non-irrigated vineyard allows us to ferment the wine with a large proportion of whole clusters in the fermenter – this year forty percent. This brings out the fruit’s natural brightness and vibrancy and builds textural richness and then some firmness on the finish – it accentuates the wine’s acidity. 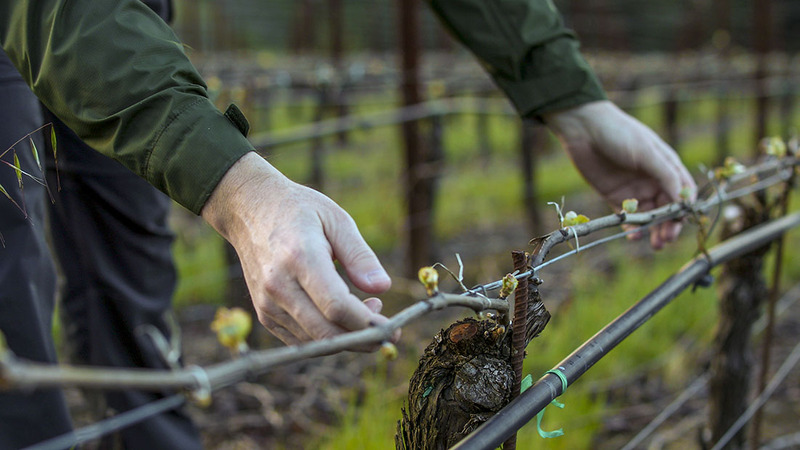 It’s a technique that’s perfectly suited to a dry vintage and allows these mature vines to express themselves fully. You should decant this if you plan to drink it soon after release but I recommend you hold a bottle or two to see the wine’s full beauty unfold over the next decade-plus. Always limited in supply as this is a tiny three-acre backyard jewel of a vineyard. Among my favorites of the vintage. Aromas of dark cherry and black raspberry, tobacco leaf, sweet cedar and grapefruit peel. Taut, focused and energetic palate entry. Soaring inner mouth fragrance and direct intensity. Succulent layers of pure deep dark cherry fruit. Graphite, tarragon and anise savory complexity. Building volume and deep structural presence. Pulsating acidity. Long aging potential – 10+ years. A sophisticated, classic fruit-driven wine accented by mineral and fresh herb notes.